SCHOOL: I’m in the second semester of this amazing writing for children program, and though I’m only taking two classes, the amount of time and analytical brain energy required in learning about the history of the picture book and illustration and the amount of time and creative brain energy required to submit, critique, and engage in the writing workshop class are overwhelming at times. TEACHING: I teach in two places. First, I teach legal research and writing at a law school. Second, I teach LSAT prep. Sort-of-third, I tutor LSAT prep. I love teaching. But teaching legal research and writing is very different from teaching LSAT which is very different from one-on-one tutoring, and they all take a lot of focus and teaching brain energy. WRITING: (1) I’m working on a WIP, let’s call it The Boarding School Book. I’m submitting portions of that regularly to my workshop class in school, as well as to my separate critique group (which also requires time critiquing others’ work). (2) I’m working on developing a project to propose (due in a week!) for a fall mentorship in my MFA program, let’s call that The Road Trip Book. (3) I’m just getting started on revisions to the completed novel, because my agent has sent me an editorial letter (oh, you caught that, did you? More on that in a moment.). Let’s call that project The Spy Book. And I’m looking longingly at my neglected blogs, considering revising a short story for submission to a new anthology my program is putting out, and wondering if I should start freelancing to bring in some much-needed cash. LIVING: You know, life stuff. Grocery store, birthday parties, planning baby showers, spring cleaning, etc. I’m tired just having written that list. So you can understand when I say I’m juggling a lot, it’s not just a matter of being busy and time constraints. It’s also a matter of juggling brain energies. Working on grading legal memoranda is very different from preparing to stand up in front of an LSAT class, which is different form creative work. 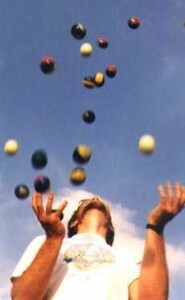 And for the first time I am genuinely trying to juggle multiple creative projects. You guys, it’s super hard. But at the same time, it’s so exciting. To have so many projects in progress and feel passionate about each one of them is its own energy booster. I’ll check back in periodically to let y’all know how it’s going…. And oh, yeah. I got an agent. She’s everything I always knew and never knew I wanted in an agent…and we’ve only just gotten started. Stay tuned for more on that. I’ll share my “how I got an agent” story sometime soon. Posted on March 24, 2013, in Life Stuff, Writing and tagged WIP, writing life. Bookmark the permalink. 1 Comment.